Mount St. Helens is located a significant distance from major metropolitan areas, roughly midway between Seattle and Portland. The nearest cities that offer a range of amenities and lodging are Chehalis and Centralia to the north and Kelso and Longview to the south. Castle Rock is the town closest to the entrance to Mount St. Helens National Volcanic Monument. If you plan to spend more than a day enjoying the sights and recreation around the volcano, camping is an excellent option, providing the most convenient access. You will find a wide range of camping facilities in Gifford Pinchot National Forest and Seaquest State Park - reservations are highly recommended. Camping in Gifford Pinchot National Forest - There are dozens of campgrounds to choose from inside GPNF, offering everything from showers, trailer sites, and horse camps to rustic locations with only a handful of sites. 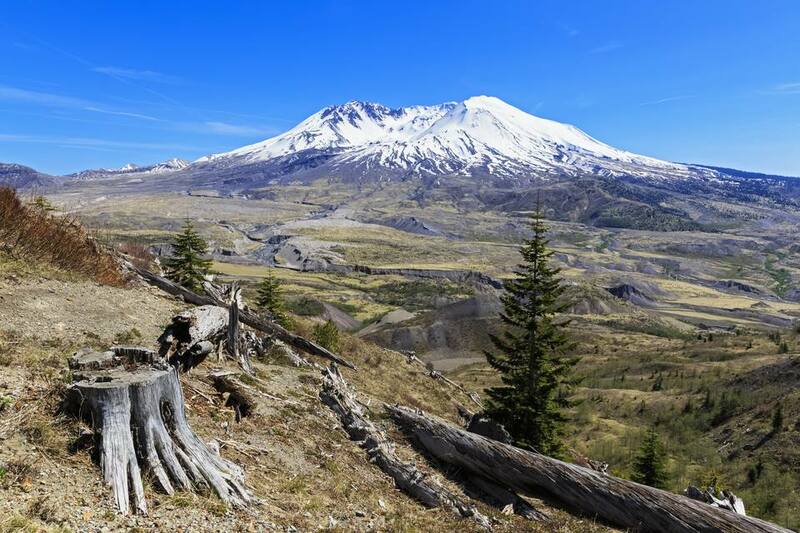 Many campgrounds are located within the boundaries of Mount St. Helens National Volcanic Monument. National Forest Cabin Rentals - Staying in a historic cabin or fire lookout can be a fun and unique lodging option. Such accommodations usually offer few amenities other than shelter, but provide easy access to recreation such as hiking, fishing, and berry picking. Camping at Seaquest State Park - The campground at Seaquest State Park is conveniently located across the highway from the Mount St. Helens Visitor Center at Silver Lake. Camp, trailer, and group sites are available, and services include cooking shelters, horseshoe pits, a playground, and comfort stations. While there is very little in the way of upscale accommodations anywhere near the entrance to Mount St. Helens National Volcanic Monument, there are a number of comfortable options. Red Lion Hotel - Kelso/Longview - If you want to enjoy a visit to Mount St. Helens without giving up your creature comforts, the Red Lion Hotel in Kelso is the closest deluxe hotel. The hotel features both fine and casual dining, meeting facilities, and a lounge. Lewis River Bed & Breakfast - Located on the banks of the Lewis River, this B&B provides comfortable rooms with private baths, homestyle breakfasts, and access to a range of recreation. The Lewis River Bed & Breakfast is a good choice for those planning to visit the south and east sides of Mount St. Helens National Volcanic Monument. Silver Lake Resort - Just a short distance from Interstate 5 and on the shore of Silver Lake, this modest resort offers incredible views of Mount St. Helens on clear days. Accommodations include motel rooms, cabins, and RV and tent camping spots. Lakeview Vacations - Located near the Mount St. Helens Visitor Center at Silver Lake, Lakeview Vacations provides a cozy cabin that sleeps four.